Nose: A powdery bouquet, with notes of dried thyme and lavender. It is a true Provencal collection of botanics. Palate: Floral with a notably lengthy finish, with citrus notes that is intense. The length is persistent, taking the lemony aromas through to the end. Yet again, the Scandinavian Cognac brand bring an innovative expression to the French region as they combine the modernity of a micro-distillery with the tradition of a Cognac maison. The Aquavit by Bache Gabrielsen is a fresh combination of two spirits; infused with a series of botanicals to give it a sweet and refreshing flavor and aroma. 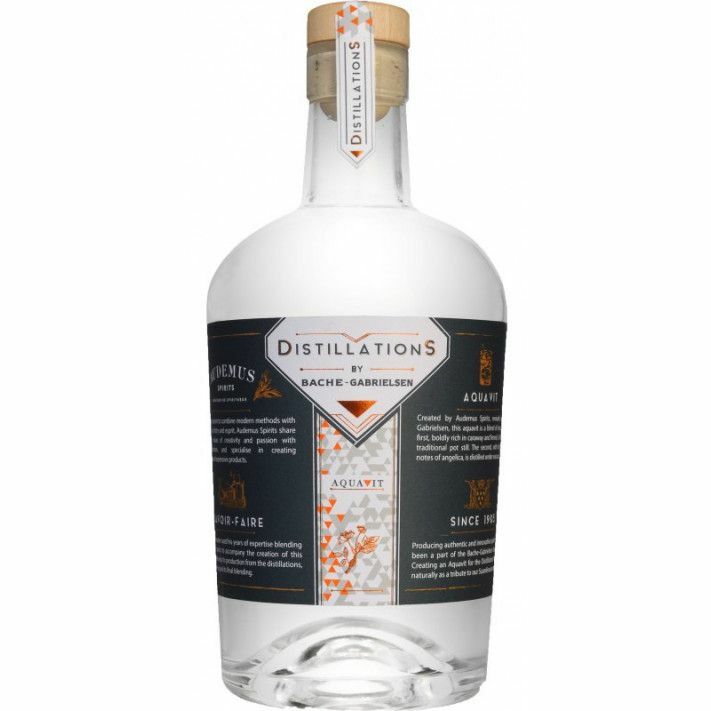 Distilled in an authentic Cognac alembic still alongside botanicals such as green anise, coriander and caraway, the second spirit is then distilled with delicate angelica in a vacuum glass. This Scandinavian aquavit is one that has been carefully nurtured by the heritage found in the Cognac region. Following the release of their fantastic American Oak Whisky Cognac in 2017, Bache Gabrielsen continue to push boundaries in Cognac assemblage and distillation with their latest collaboration with Audemus Spirits, a micro-distillery established in Cognac in 2013. The Aquavit is a Scandinavian invention, with a savoir-faire in Cognac production that dates back over a century. An artistic alliance between two creative minds, the director of the project, Jean-Philippe Bergier is the Cellar Master at Bache Gabrielsen and Mike Abouaf, the founder of Audemus Spirits created the spirit according to the artistic vision of Bache Gabrielsen. Adouaf describes the caraway and coriander as the core of the Aquavit, and that the fennel and anise give it a sweetness to soften the distilled spirit. He later describes the angelica as giving a signature finesse and freshness; all of these essential elements work together to create a subtle union in flavor and aroma. For Bergier, the vision behind the Aquavit made in Cognac was to create a refreshing aquavit without burn; one with gentle floral notes and a round body. Enjoy the first Aquavit distilled in the Cognac region. The Aquavit is best enjoyed neat, in a long drink or with cocktails or tonic water. It arrives in a clean and stylish distillation bottle; the label is graphically pleasing with tasting notes on each of its botanic contents. Eye: Clear liquid. Nose: A powdery bouquet, with notes of dried thyme and lavender. It is a true Provencal collection of botanics. Palate: Floral with a notably lengthy finish, with citrus notes that is intense. The length is persistent, taking the lemony aromas through to the end.